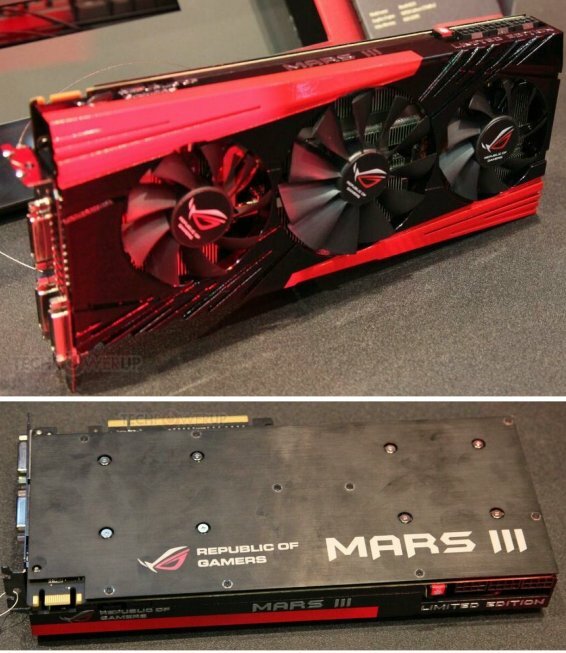 TPU spotted the ASUS ROG MARS III dual-GeForce GTX 680 graphics card at Computex. This model will be released in limited quantities, it features two 28nm GK104 GPUs with clockspeeds that match or exceed those of the GeForce GTX 680. ASUS stopped short of revealing the clock speeds. The card draws power from three 8-pin PCI-Express power connectors, next to it is an instant fan-override button that revs up the card's fans to 100%. The card gives out three dual-link DVI display outputs, and is capable of driving 3D Vision Surround using three >1920x1200 pixels displays. Unlike the MATRIX 7970 and countless recent examples of ASUS' ugly fixation with triple-slot cooling solutions, it's a pleasant surprise seeing that the triple-fan cooling solution of the MARS III needs just two expansion card slots.